Okay, I don't do this very often but I was handed a few samples to try for The Wharf...I try them and give a thumbs up or down for the store to add them to their already massive stock...but this one I lit up today warranted a fast review as I had already started smoking it. Construction: Gorgeous. A golden Connecticut shade wrapper with a soft feel and next to no veins covers this rather massive toro. It's rather heavy in hand and...just gorgeous. Pre-light Aroma and Draw: Grass, hay, some cedar, and bright citrus come across once removed from the cellophane. The draw is spot on too. Light and Burn: Absolutely perfect burn line from start to finish. Tasting: No surprises here. Smooth is the name of the game. Since I had already fired this cigar up, I will just go straight into flavors without thirds. The overall flavor is a creamy smooth woodiness. Lemon curd, fresh hay, and some grassy notes are in there too. I have found that grassy notes can be a bit harsh in Connecticut cigars but this cigar is so smooth that the flavor fits perfectly. A very mild cedar spice, light coffee, and a nice herbal note appear in the middle of the cigar. Here the creaminess really starts to shine. There is almost no bite to the smoke at all. 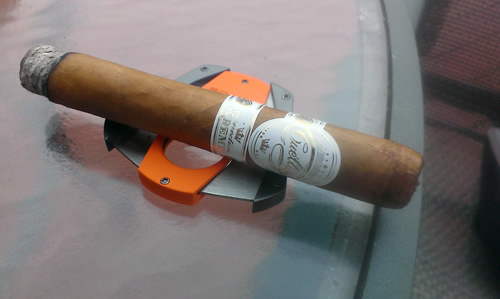 As you can imagine, it is an exceptionally mild cigar...but it does lean higher on the mild scale as you smoke it. The filler contains 16 year old criollo tobacco, hence the smooth body. Some caramel,vanilla, nuts, and extremely smooth woody characters pop up towards the end of the cigar. I am blown away. It doesn't get hot or harsh at the end either. Superb smoke all around. Value: With an MSPR of $6.50, this cigar is a perfect addition to any humidor. Final Thoughts: Looking to start smoking cigars? Look no further. This is a perfect entry level cigar for anyone...and it has enough complexity and such a unique creamy character that old salts like me will find a lot to love. A perfect morning smoke with a cup of coffee and some shortbread cookies, a habit I learned from my 92 year old Grandma. The cookies and coffee...not the cigar. 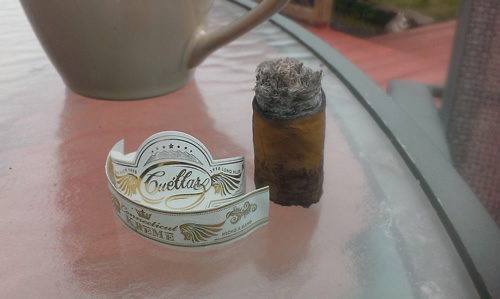 While I usually don't smoke Connecticut shade cigars unless I am reviewing for someone, this cigar is easily on my list to obtain for weekend mornings. I would love to see more sizes...something like a corona gorda or lonsdale, in this blend, but even the massive toro vitola I smoked would be worthy of a daily smoke. Highly recommended. On a fun note, I was raving about this cigar to Steve Ysidron on Facebook and it so happens he was there when Jeff Haugen blended it. Small world!